Alright, so you're a public speaker and you're not getting engagement. We got you covered. We know how to help! 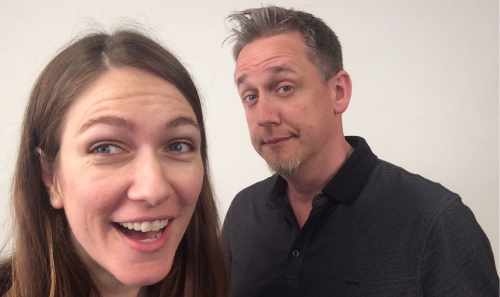 Founders Marcelle Allen and Brian Trendler, captured while desperately trying to be serious. Even the best speakers in the world are always learning, always trying new things, and always evolving. One thing we know for sure: Boring speakers also don’t get asked back, or aren’t hired in the first place. Funny speaker earn more too, by comparison to those who favor "death by powerpoint!" As long as you're coachable, we'll be a great fit. You get both trainers for the price of one because we've refined our own Laughter Coaching to advise and inspire as a team. With our knowledge of The Six Methods of Humor™, we touch upon subjects like speech structure, anecdotal stories, kinesthetic memorization techniques, movement & body work, vocal exercises, stage/space usage, even tricks with eye contact and verbal pauses. You'll certainly see an improvement after even a singular session. We can also touch upon props, visuals, and optimization of video. 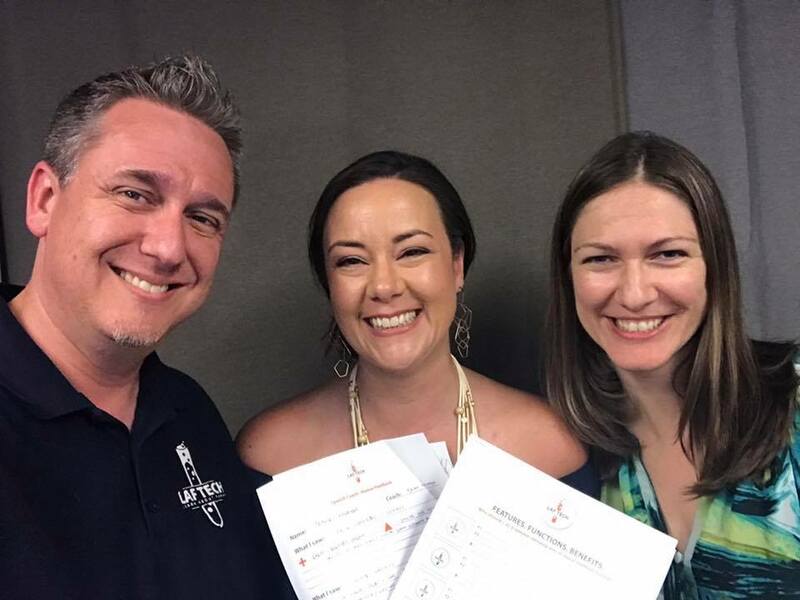 Through our improvisational exercises, we’ll help any serious presenter develop the very best message by learning their own mix of humor. We’ll make you more likable, hirable, re-hirable and memorable. Laughter Coach sessions are 60 minutes. We can work with you on a singular-session basis, or we can tailor packages to fit any speaker’s needs. Most clients purchase between 3-4 sessions in order to have the initial run-through, then at least 2 edit/improvement sessions and a final delivery session where you get to really shine! Whether you need a single session, or simply prefer a series of private trainings to re-engage your funny bone, we've got your back. Do I have to come to you?, or how does this work? When hiring us for a Laughter Coaching session, we are happy to come to you. We will not, however, have these types of sessions over the phone, or video conferencing. Why? because we take you through enough exercises and fun things that require movement, etc., that it just isn't feasible. We also highly recommend that you come to our downtown Bothell office. (Not just because we're LITERALLY on top of a Baskin Robbins store) We say this because our office environment is not yours. Just getting outside of a comfort zone is a great step into unlocking our client's potential! Plus, there is that whole, "Ice cream is right below us thing..."
Why 2 Laughter Coaches for the price of one? Great question. We feel that you deserve to get the very best out of each of your Laughter Coaching sessions. In order to provide that, unless you request otherwise, both Brian and Marcelle tag-team each session to provide (2) unique views on what they see & hear to maximize your results the fastest. Thir Humor Infusion™ process that they will take you through is also seriously cool. Imagine getting pin-point accuracy regarding areas of your presentation or speech where you can insert our humor methods to work that funny bone as an effective tool! It's pretty awesome, promise. Our Sessions are $95/per 60 minute session. We can tailor packages for multiple sessions upon request! Contact us today!